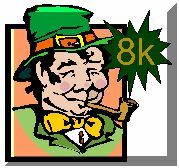 Run the Third Jewel at the St. Paddy’s Day Great Race of the Great Plains 8k on March 17th. ·Your finishing position in your age group in each race is totaled, and the lowest number for each age group wins the Triple Crown Cup for that age group! Age groups: 10& under, 11-12, 13-15, 16-19, 20-24, 25-29, 30-34, 35-39, 40-44, 45-49, 50-54, 55-59, 60-64, 65-69, 70-74, 75 & over. ·The over-all Triple Crown winners, who receive the DR.
TOM CONIGLIONE CHALICE, are the male and female whose total points for their over-all finish in each race are the lowest. In the event of ties, the tie-breaker is the finish in the Great Race of the Great Plains -whichever runner finishes higher in the March 17th 8k is the age group or over-all winner. Over-all winners do not also receive their age-group cup; it goes to the next lowest-point finisher. Awards are presented at the conclusion of the presentation of awards for the Great Race of the Great Plains. Mail-in registration form by Feb 3rd. Race Day pricing $80 ($65 - 19 & under). You do not have to specially register for the TRIPLE CROWN to be a contestant in the TRIPLE CROWN. In fact, anyone who runs in all three events has competed in the three jewels of the TRIPLE CROWN and is included in the TRIPLE CROWN competition, WHETHER THEY LIKE IT OR NOT! But, you must register for the TRIPLE CROWN to receive a TRIPLE CROWN shirt. One last detail: if your age bracket changes during the running of the TRIPLE CROWN, your point totals are calculated from your finish in the age bracket you are in when you run each race. Your TRIPLE CROWN final ranking will be based on the age bracket you are in on March 17th. NO REFUNDS! SHIRTS SIZES ARE NOT GUARANTEED BUT WE WILL DO OUR BEST TO HAVE THE SIZE YOU ORDERED. (Extra Small and 2XL are dependent on shirt supplier).